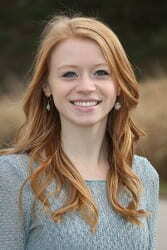 Emily Blaha of Sturgeon Bay has been chosen the December 2015 recipient of the Outstanding Student Award presented by the UW-Green Bay Alumni Association. The Business Administration senior with an emphasis in marketing and a minor in design arts will receive her diploma at UW-Green Bay’s mid-year commencement ceremony scheduled for 11:30 a.m. Saturday, Dec. 19, at the Weidner Center for the Performing Arts. The Alumni Association, which has been designating a single Outstanding Student Award recipient for each graduating class since 1976, recognized Blaha from among approximately 450 graduating seniors eligible to receive diplomas at December commencement. A 2012 graduate of Southern Door High School, Blaha will complete her degree requirements on an accelerated, three-and-a-half-year timetable. Through work and paid employment, Blaha has served as a marketing and communication assistant for the University Union, and as marketing coordinator and social media specialist for UWGB’s College of Professional Studies. Her independent study topic was “Managing Culture in a Small Business,” and her senior year placement was a product-strategies internship with Schreiber Foods, Inc., headquartered in Green Bay. She was one of a dozen standout students appointed an inaugural member of the Cofrin School of Business Student Advisory Board, providing input on curriculum and programming. Blaha is the recipient of academic merit scholarships and dean’s list honors, and is a member of the Phi Kappa Phi academic honor society. She has been active in a range of programs across campus, including service as advertising manager for The Fourth Estate, the weekly student newspaper. When she increased advertising sales by 20 percent, she was selected to serve as the organization’s business manager.